Jada and Angel’s beautiful wedding ceremony took place this past Sunday in the courtyard of The Courtyard by Marriott Sarasota Bradenton Riverfront. Jada looked amazing as she was escorted by her father down the aisle to join Angel and the rest of the wedding party at the head of the aisle. There, in front of their family and friends, the couple shared their vows, exchanged rings, and were pronounced husband and wife by Rev. Rick Lackore of Sensational Ceremonies, LLC . DJ and Ceremony Music and Sound by Michael Planas with Grant Hemond and Associates, Inc. and Venue Coordination by Tara and the rest of the staff at The Courtyard. Wedding Photographer Alex with Melissa Lauren Images provided this touching photo of Angel as he wiped a tear from Jada’s cheek as she shared her vows with him. 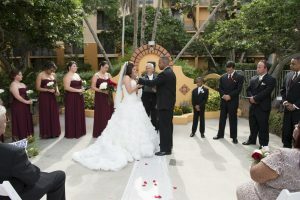 Congatulations to the new Mr. and Mrs. Angel Medina!